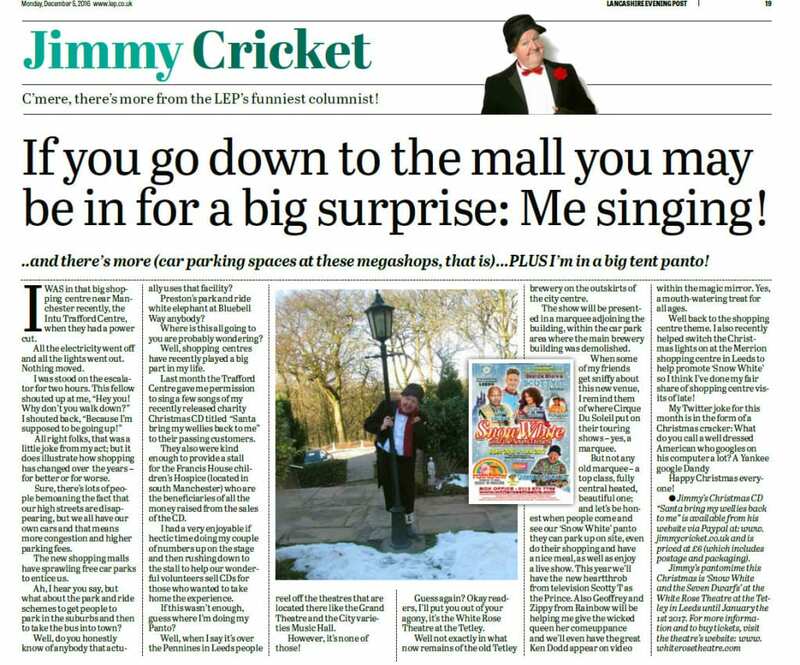 Jimmy Cricket’s latest pantomime is the focus of an article in a city lifestyle magazine. The famous entertainer, 71, who is currently playing the Court Jester in the classic fairytale Snow White and the Seven Dwarfs at the White Rose Theatre, was interviewed for the Leeds-based Northside publication. It has been published in the December edition to tie in with Jimmy’s appearance in the panto, which opened on Thursday (8 December). The White Rose Theatre is a new 1,400-seater arena, which has been built in a large marquee complex located within the premises of the Tetley contemporary arts gallery and near Leeds’ main train station. It also features reality TV celebrity Scotty T, who won this year’s Celebrity Big Brother on Channel 5 and plays the role of Prince Charming. Actors Louis Emerick (from Last of the Summer Wine and Brookside fame) and Tupele Dorgu (who has appeared in Coronation Street and Hollyoaks) are the Royal Tax Collector and the Wicked Queen respectively. And there will be cameo performances from children’s TV programme Rainbow’s George and Zippy, plus a recorded sequence starring Jimmy’s very good friend and fellow comedian Ken Dodd. * The show will run until 1 January 2017 and tickets are now on sale – visit www.whiterosetheatre.com or ring 0113 870 7769. Jimmy Cricket has been looking back in his latest newspaper column on his recent visit to a top shopping centre – and looking ahead to the pantomime he is starring in, which starts tonight (8 December). Jimmy’s promotion of his new charity Christmas CD continued at the Intu Trafford Centre on the outskirts of Manchester. The popular 71-year-old comedian was invited to perform some tracks from the CD, entitled Santa bring my wellies back to me, on the stage area of the Orient section of the mall. Volunteers and staff from the Francis House Children’s Hospice – the very worthy cause Jimmy’s CD is in aid of – were also present. * The new charity Christmas CD is available to buy from this website through a PayPal facility or in person directly from the hospice. Jimmy will play the Court Jester in the classic fairytale Snow White and the Seven Dwarfs at the White Rose Theatre in Leeds City centre from 8 December to 1 January. The White Rose Theatre is a new 1,400-seater arena, erected in a large marquee complex located within the premises of the Tetley contemporary arts gallery and near the city’s main train station. This first evening performance on Friday 9 December will be a special charity preview of the show, where three local charities will stand to benefit greatly as all ticket sales will be shared out between them. 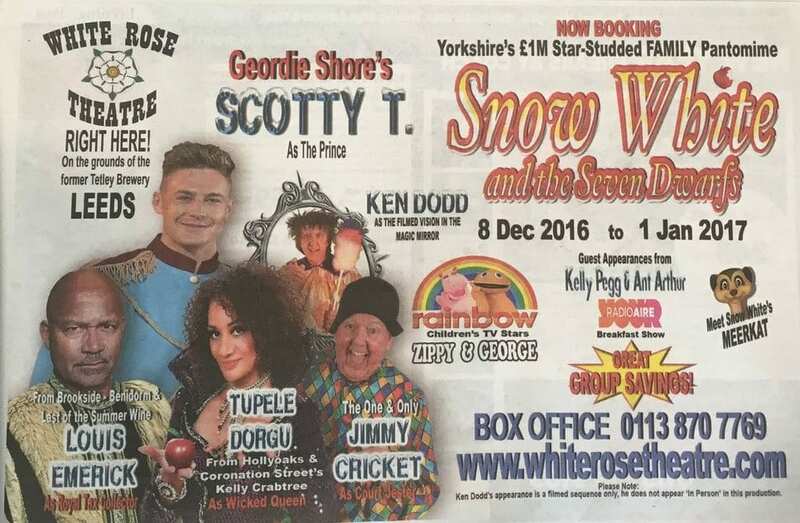 The panto also features reality TV celebrity Scotty T, who won this year’s Celebrity Big Brother on Channel 5 and will play the role of Prince Charming. Actors Louis Emerick (from Last of the Summer Wine and Brookside fame) and Tupele Dorgu (who has featured in Coronation Street and Hollyoaks) will play the roles of the Royal Tax Collector and the Wicked Queen respectively. In his Lancashire Evening Post column , Jimmy says: “This year we’ll have the new heartthrob from television Scotty T as the Prince. “Also Geoffrey and Zippy from Rainbow will be helping me to give the wicked queen her comeuppance and we’ll even have the great Ken Dodd appear on video within the magic mirror. * The show will run from 8 December 2016 to 1 January 2017 and tickets are now on sale – visit www.whiterosetheatre.com or ring 0113 870 7769. Popular veteran entertainer Jimmy Cricket is about to begin rehearsals for the pantomime he will feature in over the Christmas and New Year period. The 71-year-old comedian will play the Court Jester in the classic fairytale Snow White and the Seven Dwarfs at the White Rose Theatre in Leeds City centre from 8 December 2016 to 1 January. A pantomime which will star famous entertainer Jimmy Cricket is now only five weeks away. Ever-popular comedian Jimmy, whose last panto appearance was at Preston’s Charter Theatre two years ago, will play the Court Jester in the classic fairytale, Snow White and the Seven Dwarfs. It will be staged at a brand new venue that is being set up in the centre of Leeds for the festive season. The White Rose Theatre will be a new 1,400-seater arena, which will be erected in a large marquee complex located within the premises of the Tetley contemporary arts gallery and near the city’s main train station. The company behind this new venue, Mobile Structures, also supply temporary performance areas to festivals such as Glastonbury and to the Disney company for the presentation of their popular ice shows around Europe. 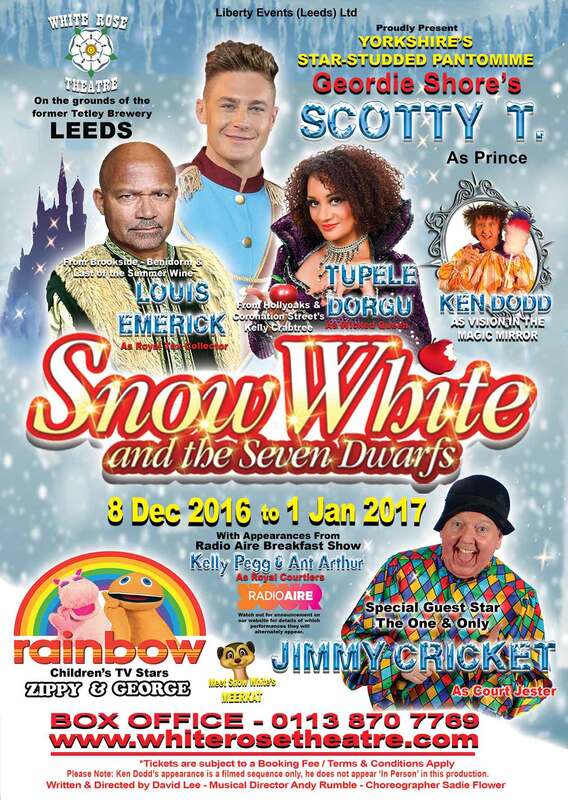 This Leeds pantomime features reality TV celebrity Scotty T, who won this year’s Celebrity Big Brother on Channel 5 and will play the role of Prince Charming. Returning to Christmas panto? Oh yes he is! 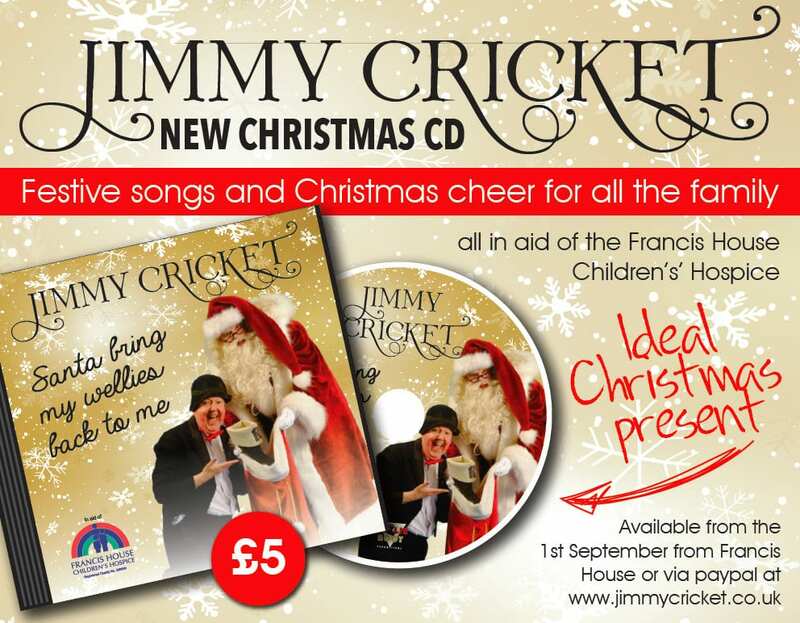 Jimmy Cricket’s plans for Christmas 2016 have now been revealed…. The much-loved family entertainer will be the special guest in a pantomime production of the classic fairytale, Snow White and the Seven Dwarfs. Jimmy, whose last pantomime appearance was at Preston’s Charter Theatre two years ago, will play the Court Jester. This Christmas show will be staged at a brand new venue, which is being set up in the centre of Leeds for the festive season. The White Rose Theatre will be a new 1,400-seater arena, which will be erected in a large marquee complex located within the premises of the Tetley contemporary arts gallery. The show, put together by experienced pantomime producer David Lee for Liberty Events, will also star reality TV celebrity Scotty T, who won this year’s Celebrity Big Brother on Channel 5 and will play the role of Prince Charming. It will also feature an actor and actress who have become instantly recognisable to many people through their appearances in Brookside and Coronation Street. Louis Emerick and Tupele Dorgu will play the roles of the Royal Tax Collector and the Wicked Queen respectively. The show will run from 8 December 2016 to 1 January 2017 and tickets are now on sale – visit www.whiterosetheatre.com or ring 0113 870 7769. 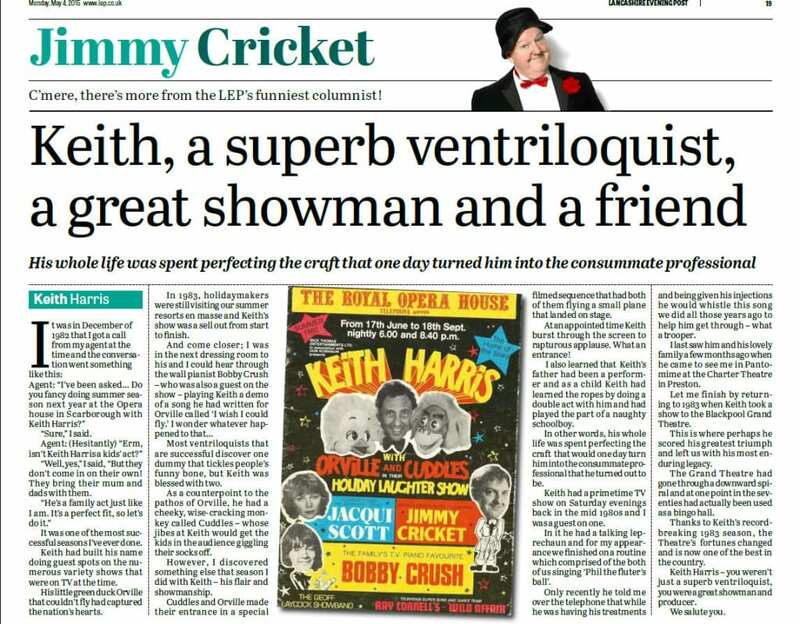 Jimmy Cricket has been paying tribute in his latest newspaper column to ventriloquist Keith Harris, who died last month. Keith, who, with his puppet duck Orville, became a regular feature of Saturday night TV in the 1980s, was 67. In addition to fronting The Keith Harris Show on BBC One, he (and Orville) gave private performances at birthday parties for Prince William and his brother Harry, at the request of Diana, Princess of Wales. His 1982 single, Orville’s Song, was a top five hit, selling more than 400,000 copies. In his May column for the Preston-based Lancashire Evening News, Jimmy says: “Most ventriloquists that are successful discover one dummy that tickles people’s funny bone, but Keith was blessed with two. “In 1983, holidaymakers were still visiting our summer resorts en masse and Keith’s show was a sellout from start to finish. “Keith Harris – you weren’t just a superb ventriloquist, you were a great showman and producer.